Due to the July 4th holiday, it’s been two weeks since I’ve been out to check the hives at the Sunshine Community Gardens. The girls have certainly been busy filling up the top most super with honey. The honey looks darker than the honey I pulled off from Baab-Brock Farms. I think a pollen analysis is definitely in order when I harvest 8 frames from this hive. I’m very curious on what the girls have been feeding on either from the gardens or the surrounding area. Since all eight frames were drawn out with wax and honey on the top super, I went ahead and added another one. I’ve always loved my frame grip for inspecting frames because it allows me to leave one hand free for other tasks. I also find it makes a handy frame spacing guide when adding on a new super. 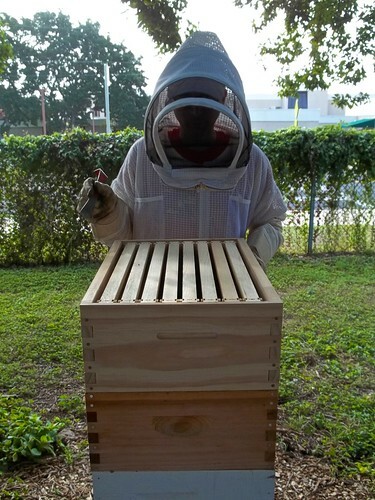 It is very important to get frame spacing correct otherwise you may find yourself having issues down the road as the bees will try and fill any large gaps to get the proper spacing in the hive. Here is a shot of some nicely spaced frames ready for the girls to start working. I am liking the framegrip. Might have to get one of those. 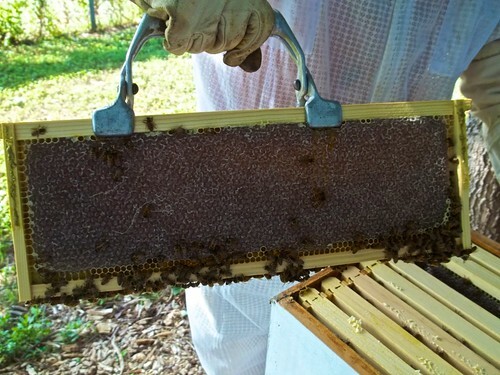 Beautiful frame of capped honey. Did you ever find out what the girls were foraging on? For the Community Garden hive, I really have no idea what the girls are bringing back. There are tons of sunflowers, roses, and a huge variety of veggies around so I’m guessing that is the main source of their foraging. 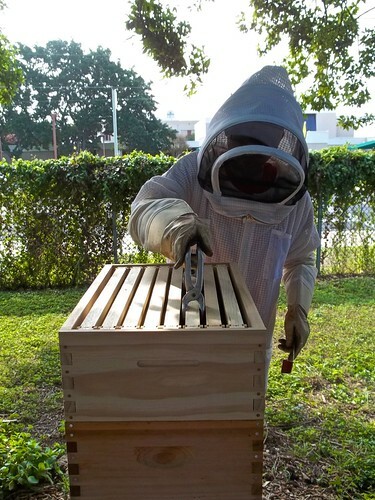 I’ve been through two Texas winters with my hives. The first year was very cold (for Texas) and the second was mild. In both cases I left at least 12 full frames of honey, and they did just fine. In fact, there was honey leftover in the spring that I was able to harvest.